Men’s aged brown color watch cuff made with veg tanned leather, completely handmade, hand tooled, hand stitched with natural thread. The leather cuff is 2 1/2 inches wide. 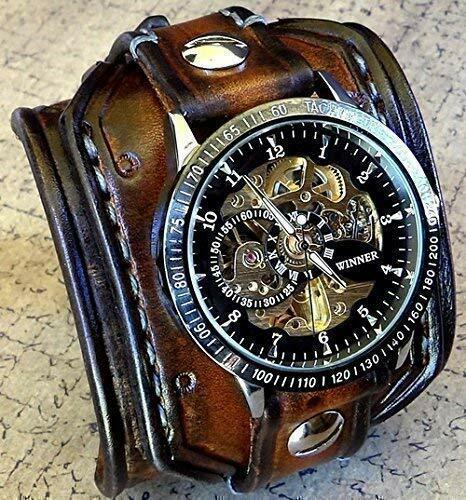 Item includes automatic mechanical steampunk watch face what is removable and interchangeable. The watch needs to be winded manually, there is no battery needed. Heavy duty buckle provides closure. — Engraving is NOW available. If you would like to add engraving, please leave the font type at check out to the “note to seller” section. Orders without a note will be engraved with Arial. THIS WATCH IS MADE TO ORDER, please use the following measuring technique to determine your wrist size: Measure your wrist over and around the wrist bone using a measuring tape, do not add to it. You want to measure is the distance around your wrist. This is important so please make sure it is accurate. You should not confuse this distance with the total length of the band, which will be greater. We’ll take it from there, and make allowances for such considerations as breathing room. Wrist size over 8″ will cost an additional $10 due to extra material. Please email us if your wrist size is over 8″ and we will send you a listing.